Yesterday the Tree Museum opened outside of Zurich in Rapperswil-Jona, Switzerland, showcasing an incredible collection of 2,000 different species of trees. The museum was designed and built by Swiss landscape architect Enzo Enea with the help of Oppenheim Architecture + Design (OAD), who designed Enzo Enea’s new headquarters. The Tree Museum and the sustainably-built headquarters are located on the grounds of a 14th Century monastery, and the museum displays Enea’s personal collection of trees, which he has gathered over the past 17 years. Enzo Enea selected Chad Oppenheim from a group of eight leading architects from around the world to design the headquarters along with the Tree Museum. Enea chose Oppenheim because he felt that he best understood what he wanted to accomplish with the Tree Museum — the headquarters are designed to act as the perfect backdrop to showcase the trees. The building itself does include a number of sustainable features, such as the use of sustainably-sourced local wood, which blends with the surrounding forest, natural daylighting, efficient insulation, a green roof and a geothermal heating and cooling system. The Tree Museum houses 2,000 trees on 2.5 acres, with a special installation of about 50 species personally curated by Enea from around the world. 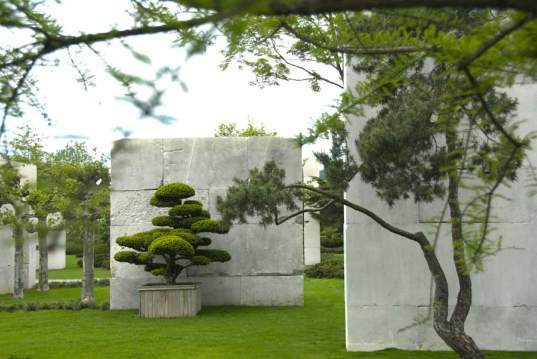 Trees are highlighted against sandstone wall backdrops and include 22 different varieties ranging from Taxus baccata to English yew, Pinus sylvestris, and Scotch pine. Enea has collected these trees over the last 17 years during various projects when trees had to be removed from the site. So instead of getting rid of them, he kept them and now has his own special museum, where visitors can view hundreds of trees for a reasonable fee. 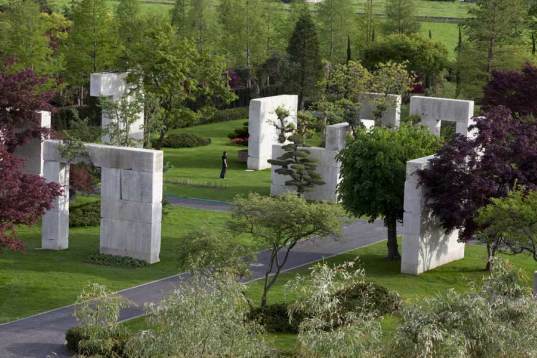 Nice project, even if it does look a bit like a cemetery with all those slabs. I'm not sure the trees appreciate having their light source blocked from one side either. Within a season or so they will defoliate and become ragged on the shaded side. But wouldn't it be lovely to see many more such projects appear in other communities? Oh..wait a minute.... we already have them! They are called "arboretums". This means simply, "places where trees are collected" and, umm, mused over. We've had them around since the Babylonians built their hanging gardens, and the Chinese emperors established palace gardens. Nothing new there :) Other places to look for collections of trees near you are botanic gardens and parks. Might be fun to get to know them better. Editorial note: "...different varieties ranging from Taxus baccata to English yew, Pinus sylvestris, and Scotch pine..." Actually Taxus baccata IS english Yew, and Pinus sylvestris IS Scotch Pine. Thus the list of four examples is really two. Sometimes it's good to do some homework before posting. Lovely, civillized concept. Note the time span used to set it up. Melissa has it occurred to you that the very act of hopping on a plane which so many of us do is unnecessary contribution to the environmental mess we are trying to cope with? perhaps more of us could plant and nurture foliage (indigenous of course)in the area we live so there becomes no need to travel to see them as the treasures that they are. cheers Mum. What a beautiful idea and gorgeous place! I'm ready to hop on a plane to visit this unique museum. With such an incredibly exquisite display of Mother Nature's green beauties, you can be sure that the people who "experience" this museum will want to treat trees with the respect they deserve. I hope this idea catches on in other countries.... what a wonderful tribute to the majesty of trees! Thank you for sharing. 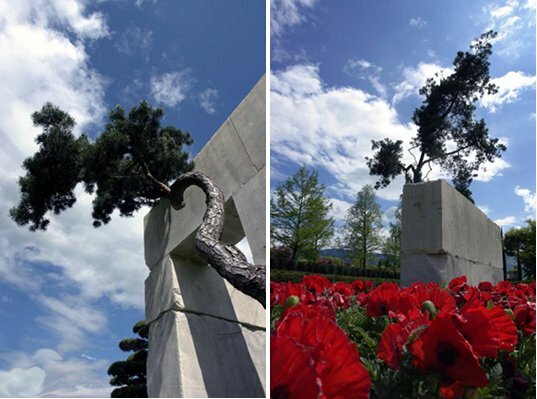 Yesterday the Tree Museum opened outside of Zurich in Rapperswil-Jona, Switzerland, showcasing an incredible collection of 2,000 different species of trees. The museum was designed and built by Swiss landscape architect Enzo Enea with the help of Oppenheim Architecture + Design (OAD), who designed Enzo Enea's new headquarters. The Tree Museum and the sustainably-built headquarters are located on the grounds of a 14th Century monastery, and the museum displays Enea's personal collection of trees, which he has gathered over the past 17 years.